I was trained not to ever, ever, ever, EVER preach off a computer. I still think that’s sage advice. No one wants to see the lid of your laptop as you preach from the pulpit or the blue haze that inevitably radiates across your faith. It ruins the intimacy of preaching — and let’s remember that preaching is always an act of testimony. I don’t care how close you think you are to God, you are not the only one that thinks so. There are plenty of other people that think they have a direct line to God and we all disagree. Preaching is always saying what you know to be true about God in that moment. And friends, you can’t read that sacred testimony on a laptop. I’m equally staunchly opposed to reading our sacred text during worship from anything but an actual book. That bound thing on the pulpit or the lectern. If you unroll a scroll, I’m fine with that too. But please don’t hold your fancy PDA, Blackberry or iPhone to read our sacred text in worship. Do it in your private study. I’m totally cool with that. Power to you. Not in worship. So, it’s for these reasons that I have some extreme hesitations about using an iPad to preach my testimony on any given Sunday. But I did buy one. I bought an old one off of Craigslist after some sly encouragement om my dear friend Lara. I bought it because I wanted to save paper. It’s as simple as that. I’m not sure how much energy I actually save in charging this device but the amount of paper I uses for sermons, burials, funerals, weddings and other ritual moments was literally breaking my heart. I just couldn’t do it anymore. There had to be another way. So I bought this expensive contraption. It took me a long time before I was ready to actually climb into the pulpit with this computer. I’ve already told you how I feel about laptops and such. I don’t need to repeat myself. Well, there was another challenge. I have been preaching without notes. 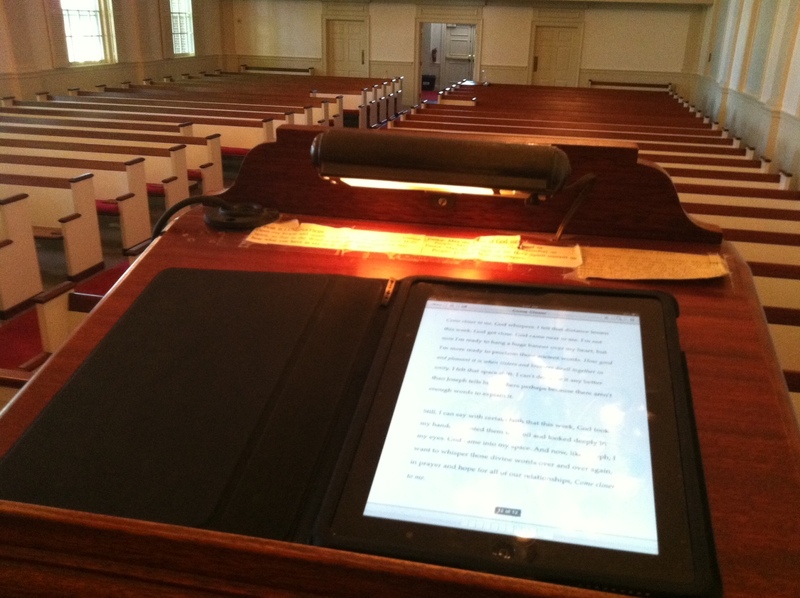 Thus the iPad would serve no purpose, but I’m not feeling as compelled by this preaching without notes thing. That’s another story and a totally separate blog post. Nevertheless, things are changing in my approach to preaching — as I hope is always true — and I decided to preach from my manuscript on my iPad. I consulted the experts. (I apparently copied the idea for this photo. It’s a compliment, right?) I asked the good people on Twitter and Facebook. I wrote my sermon entirely in Pages. I was after all writing on the plane on my return from Conference 2011. I saved it as a PDF and opened it in iBooks. And I preached. There are a few other pearls of wisdom that you’ll want to know. In this experience, I learned there is a side switch that can lock the orientation. You can choose to do that in Settings. It’s also important to adjust your Settings so that your screen doesn’t go dark or lock every 10 minutes. It’s also sage to turn off your sound as no one wants to know if you have email. That ruins the intimacy as much as that laptop lid. I’m not sure that this will dramatically change my ministry, but I do hope it does a little bit to heal the earth.